I have spent many sunny days in the Botanical gardens admiring the wildlife, people watching and generally feeling like I’m not in a big city. Close to nature. Just how I like it. I saw some people feeding the birds and wanted to give it a go. I really wanted the sulphur crested cockatoos to land on me as I had seen other people adorned with these beautiful birds. Typically when we arrived in the park there were none to be seen (or heard.) We took a packet of breadcrumbs from the free shelf in the hostel and set about attracting pigeons and any other avians hoping our white feathered friends would show up. Sadly this tactic failed and even earned us a telling off from one of the locals ”Please don’t feed the birds” she said. So we wandered off in another direction still in pursuit of the elusive cockatoo. 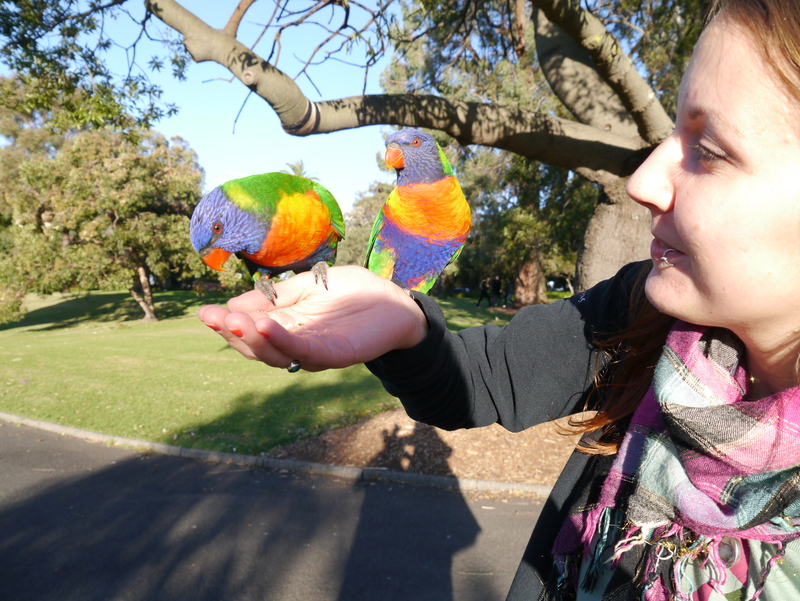 Although we didn’t manage to attract a cockatoo we did make friends with a couple of rainbow lorikeets which were happy to take food from our hands. This was a nice substitute but feeling defeated we watched the sun setting then headed home. On the way back we heard some squawking from above and looked up to see a flock of cockatoos in a tree. So we sprinkled some bread crumbs and with a lot of persuasion the birds came over. 18 Aug	This entry was published on 18/08/2012 at 16:17 and is filed under Uncategorized. Bookmark the permalink. Follow any comments here with the RSS feed for this post.